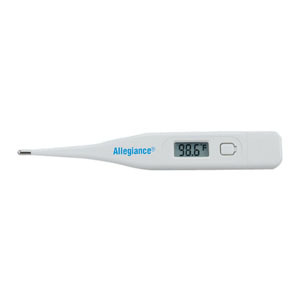 Allegiance® Economy Dual-scale Digital Thermometer, 4 15/16" L x 3/4" W x 3/8" H, Mercury-free, Water-resistant. Digital thermometer provides readings in approximately 90 sec. in either Fahrenheit or Celsius with an easy-to-read LCD. It comes with a memory capable of storing the last temperature taken. When the peak temperature is reached, the °F (°C) will stop flashing and the thermometer will sound four long beeps if the temperature is below 99-1/2°F (37-1/2°C). If the temperature is above 99-1/2°F (37-1/2°C), the fever alarm will sound eight sets of three short beeps. An automatic turn-off feature activates after approximately 10 minutes of inactivity. Includes five probe covers. Digital thermometer provides readings in approximately 90 sec. in either Fahrenheit or Celsius with an easy-to-read LCD. It comes with a memory capable of storing the last temperature taken. When the peak temperature is reached, the °F (°C) will stop flashing and the thermometer will sound four long beeps if the temperature is below 99-1/2°F (37-1/2°C). If the temperature is above 99-1/2°F (37-1/2°C), the fever alarm will sound eight sets of three short beeps. An automatic turn-off feature activates after approximately 10 minutes of inactivity.